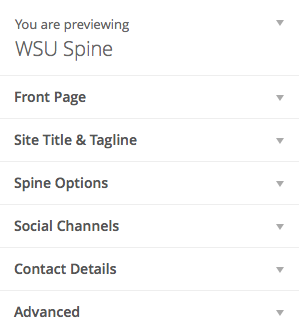 As a visual element, the WSU Spine is a 198px wide column that binds together the many websites of wsu.edu. As a framework, the WSU Spine is a minimal template that provides global tools and a responsive and flexible grid for every WSU website. With a uniform and global spine on the left and a blank, unwritten page to the right, the Spine balances the unity and diversity of our university. After logging in, head to the Customizer. Enter your Site Title and Tagline. Expand “Contact Details” and enter the information of the unit responsible for this site. Optionally, you can replace or remove one or more of the university’s social channels. Optionally, you can alter the Spine’s default behavior in “Spine Options”. Head to Pages and Appearance -> Menus to begin building out your site. And finally, delete or modify your Hello World post to remove this primer.